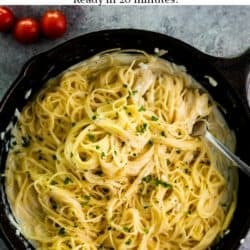 Just a single pot is all you need to prepare this Creamy Parmesan Garlic Pasta. Angel hair pasta simmers in this savory sauce for just five minutes, you’ll never find a quicker or easier pasta recipe than this! Finding a recipe that’s this quick is amazing, but almost painful because you wonder why you haven’t been making it like…your whole life. I honestly couldn’t believe how quick this was. 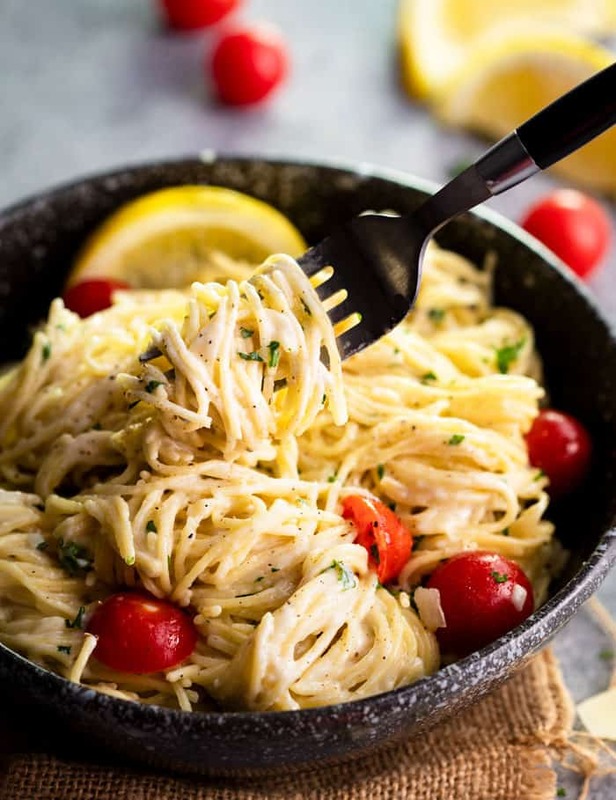 Angel hair takes no time at all to make, and neither does this amazingly delicious, creamy, flavorful Parmesan Garlic Sauce. As easy as this recipe is, let’s go over a few things first! Using different kinds of pasta is perfectly fine. I love angel hair because it’s quick and the super thin noodles are just fun. 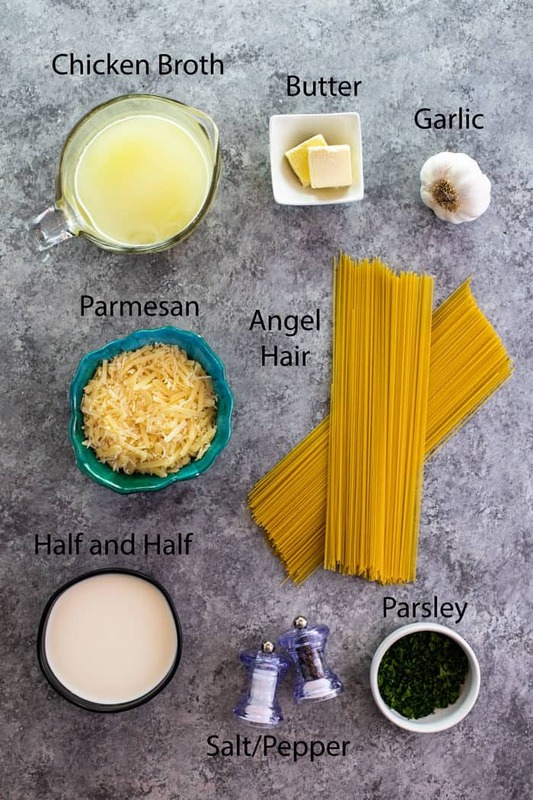 But, if you prefer to use regular spaghetti or other thicker pastas, use 2 cups of chicken broth instead of 1.5, and increase the simmering time based on the instructions on the package. Refrain from adding cold ingredients into warm pasta when you prepare it. This includes the cheese, half and half, and/or milk. The consistency will be super creamy if you follow this instruction. Purchase a block of high-quality Parmesan cheese. Always shred the cheese yourself, it will taste and melt much better. Sprinkle flour over the cheese. This helps to thicken the water that separates from the cheese once it begins to heat up. Let the cheese come to room temperature before adding it to the warm (not hot!) base. Add the cheese gradually as opposed to all at once. A great meatless protein-rich addition would be spinach, which you can incorporate 1 minute before the pasta is done, it will wilt very quickly. Cooked asparagus or broccoli are other vegetables that are high in protein. These could be steamed ahead of time and added to the meal once the pasta is cooked. Seared Chicken or Steak would make tremendous additions to this meal. I recommend searing the meat in the skillet first, setting it aside, and cooking the rest of the meal in the same skillet. The chicken broth will deglaze the pan and give the sauce amazing flavor! 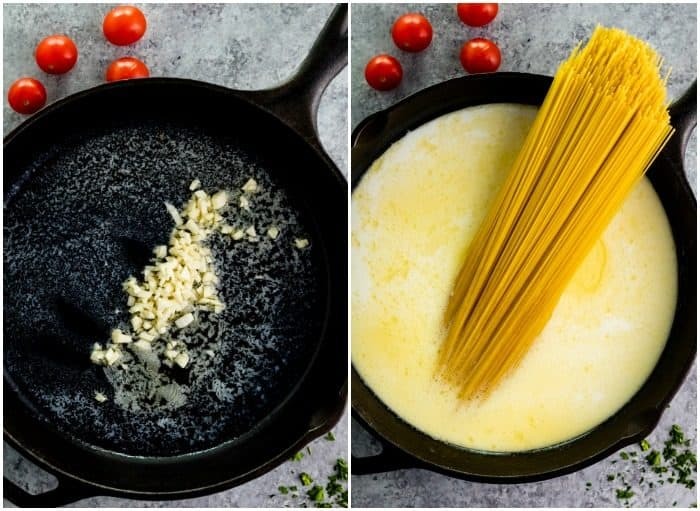 Once the Parmesan cheese has been incorporated into the pasta, slice the chicken or steak into strips and top the skillet with it. Seared Shrimp would also be a great way to top off this meal! Leftovers should be stored in an airtight container in the refrigerator for up to three days. 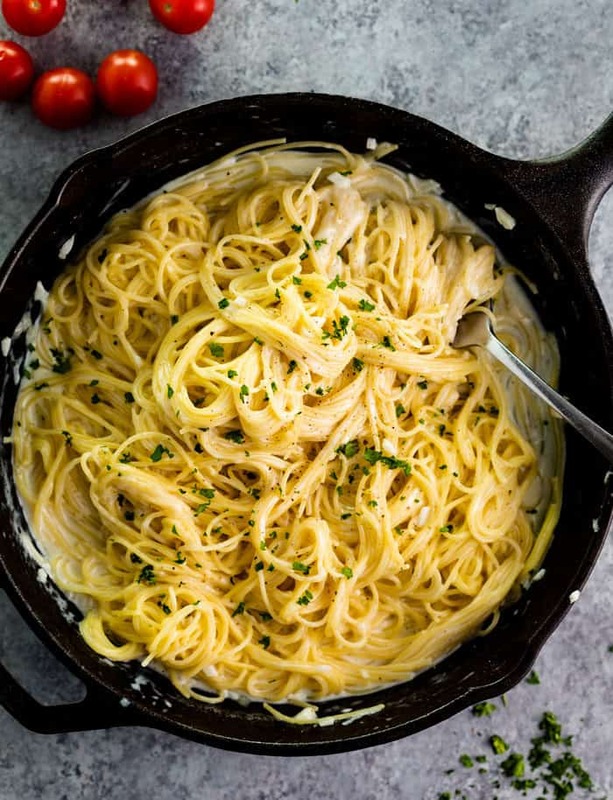 Just a single pot is all you need to prepare this Creamy Parmesan Garlic Pasta. Angel hair pasta simmers in this savory sauce for just five minutes, you'll never find a quicker or easier pasta recipe than this! Shred the Parmesan cheese and set it aside to allow it to get to room temperature. Toss the cheese with ½ Tablespoon of flour. This is optional but will help the sauce remain smooth when the cheese is melted into it. 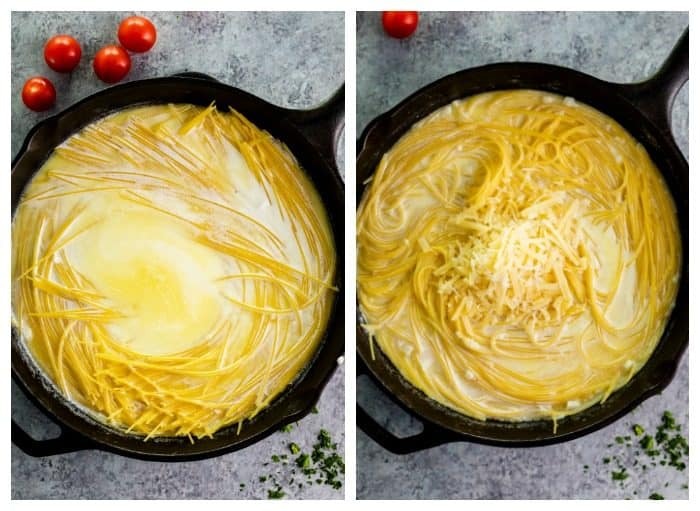 Melt the butter over medium heat in a large cast iron skillet. Add the minced garlic and cook for 1 min 30 seconds, stirring as it cooks. Add in the room temperature milk/cream. If it's still chilled, temper it in the microwave for 20 seconds. Add the pasta. If the noodles are too long for the pan it will begin to bend as it heats and will then fit into the pan. Kitchen tongs help with this. Let the pasta simmer for 4-5 minutes. Stir it every 30 seconds or so. Remove from the heat. Gradually sprinkle in the Parmesan cheese, stirring as you do so, until smooth and well-combined. Slice a fresh lemon into fourths. Squeeze the juice from one of the wedges over the pasta. Use the remaining slices as a garnish. Slice cherry tomatoes in half and sprinkle on top of the pasta along with the chopped parsley. (Cooking the tomatoes in the warm sauce will eventually cause the sauce to turn pink so be careful about that.) -Serve and enjoy! *Milk or a combination of milk and cream can be used as well. This is an excellent recipe that’s quick, easy and inexpensive to make. Adding additional ingredients is endless, sausage, sliced chicken, mushrooms, onions, bacon, etc. Stephanie, if I want to cook in the Instant Pot, would you suggest 4 minutes on Manual adding tempered Half & Half last? Thank you!! Hi Ryan! I wouldn’t recommend putting angel hair in the instant pot, it can overlook really easily. You could do spaghetti though, and cook that for 8 minutes with the chicken broth, butter, garlic, etc. — When it’s done stir in the tempered half and half and Parmesan cheese and you’re in business! Criss cross the noodles in the instant pot so they don’t stick together. I haven’t done this myself but if I were to attempt it, that’s what I’d do. I’d also use 2 cups of chicken broth for that method! I just love that you post a picture of all of the ingredients in most of the recipes you post. It makes it look easier to me for some reason. I enjoy all of you recipes!